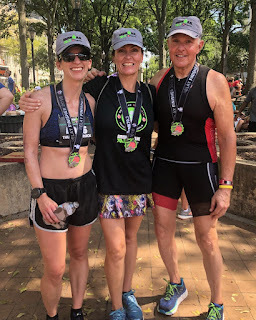 Augusta 70.3 Relay Race Report: Team Thunderstruck! During #soberJanuary, I went to Jekyll Brewing with a group of friends I'd met through the SFTC (South Forsyth Tri Club) and despite being sober and unsure of my impending injury, I ended up halfway agreeing to do the run portion of the August 70.3 Ironman relay. Booted in February and March, I was reluctant to commit right away. April and May slipped by unnoticed and by the time I was approached about it again, I was back in the stupid boot. June and July passed with misery and when I started running again, 13.1 miles seemed like it was going to be really, really hard. But since I mumbled something to the effect of that sounds like a fun idea back in January, I sent Rudy the money for the team and hoped for the best. 7 weeks after being cleared to run, I found myself sitting on my front porch waiting for Casey to pick me up at 6:00 a.m. to head to Augusta. 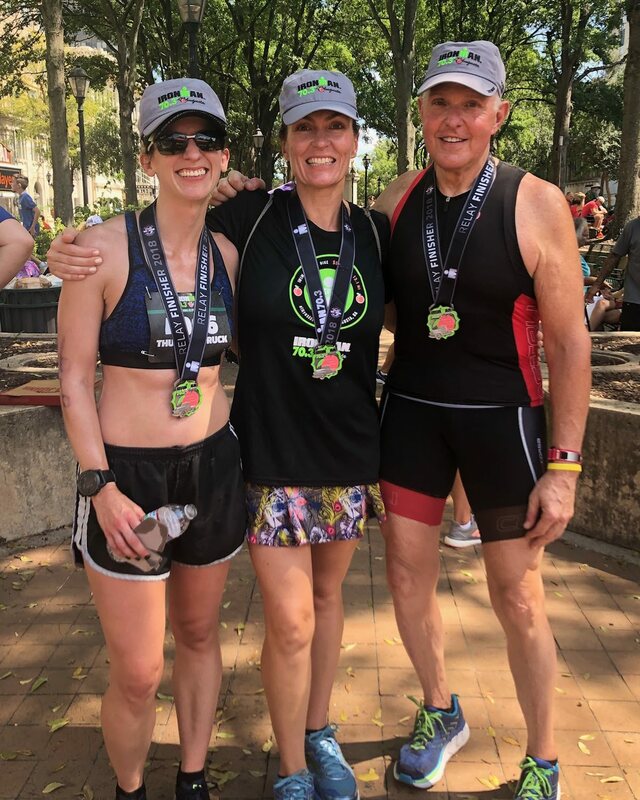 Going with a bunch of people who have competed in many, many triathlons was advantageous. They eagerly answered my thousands of questions and I soaked in all the knowledge they dispensed. I had met Beth at the January event and she was our swimmer, the first event in the race. 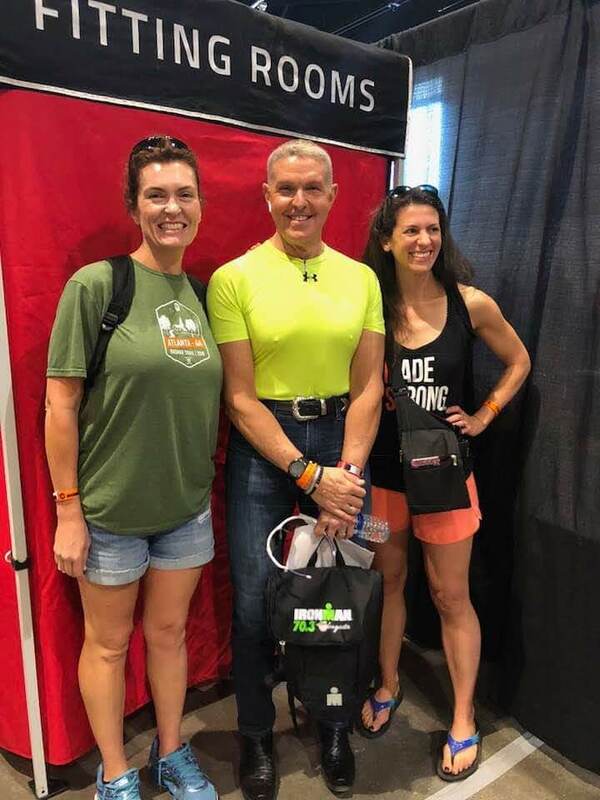 Every assured me that Doug was incredibly strong on the bike and they were excited that our team had a chance to put up a solid time in the relay category. Truth be told, this put some pressure on me to perform well as despite everyone reminding me it was for fun, I didn't want to let my teammates down. 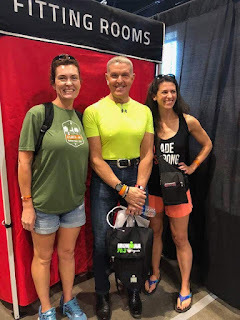 Doug and I finally met at registration where we picked up our bibs, ankle timer, t-shirts, bags, etc., etc. Lyndsay coordinated dinner at Savannah River Brewing company where we dined on Moe's and carbo-loaded with a few beers. 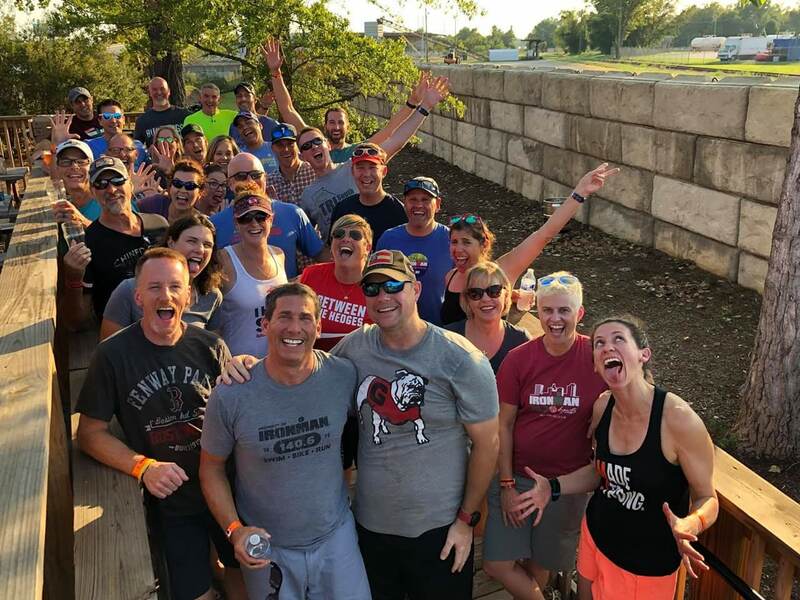 It was a good way to forget about race nerves for awhile and complain about the impending warm day ahead for all of us toeing the line. I laid out my flat girl at the hotel and got excited about racing in the morning! Casey and I managed to get to sleep at a reasonable hour and I felt mostly rested when the alarm went off at 5:30. I rode with the group to transition and passed Miranda Carfrae amongst the sea of bikes! 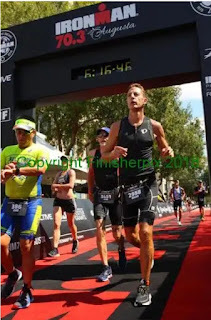 I am a big fan of triathlon despite having never raced one myself so I was fangirling pretty hard. Back at the swim start, I watched the SFTC members slowly make their way towards the dock to start their races. They had a self-seeded start which made it look like a huge group of lemmings just following the crowd into the water. Once I saw the final club members off, I walked back to the car and tried to cool off and rest a bit before getting my day started. I wanted to take a nap, but I was too excited to race so I just enjoyed putting my legs up and eat my overnight oats (with a banana peel because I forgot a spoon). Following the tracker, I saw that the first pro male, Tim O'Donnell, was about to be running by so I hopped out of the car and managed to catch him coming through on his first lap. I watched for a few more minutes and then proceeded to get ready to race. I put on pounds of sunblock and Vaseline, changed into my Vaporflys, and told Sam & Kathleen I was going to do a warm-up run to the start. The goal was to run 15 miles total with 12 at marathon pace in preparation for NYC. 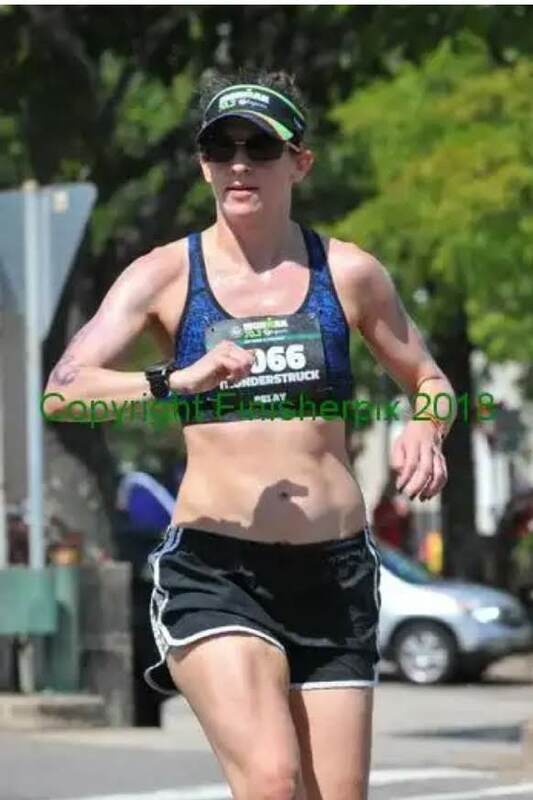 I have no idea what marathon pace is right now and coupled with the 90°+ and noon start, I was just ready to hold on for what felt like hard tempo. But, I knew that I would feel better prepared in NYC if I was doing these longer runs as prescribed, so I slowly jogged to the start line. Having just met Doug the day before, I realized it might be tough to spot him when he came in. So I tried to keep an eye on the relay tent despite all the action happening around me at the bike transition. 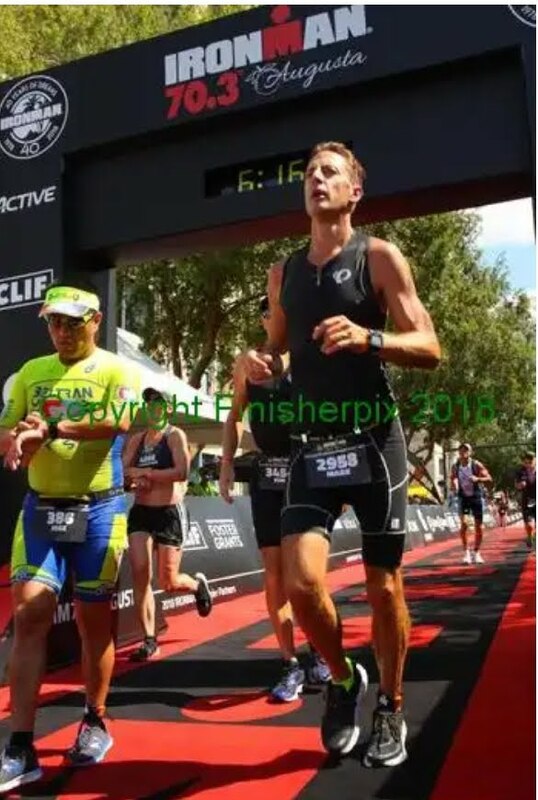 It was all so interesting - watching some people sprint from their bikes into the run and others taking their time to compose themselves before jogging to the next portion of the race. Sam and Kathleen made it to the relay tent and they helped fill the time before Doug arrived. Unfortunately, Sam (who had promised to help me keep an eye out for him, oops!) had walked away and I was watching the run start when he came in. I sprung to action and we wasted no time throwing the ankle timer on me. And just like that, I was off! 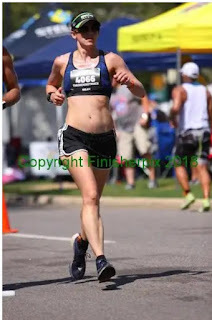 I told myself to take it easy in the first mile, but I sprang into the race with fresh legs and competitive juices flowing after missing out for 5 months. 99% of the people I was sharing the course with had just swam 1.2 miles and biked 56 miles. 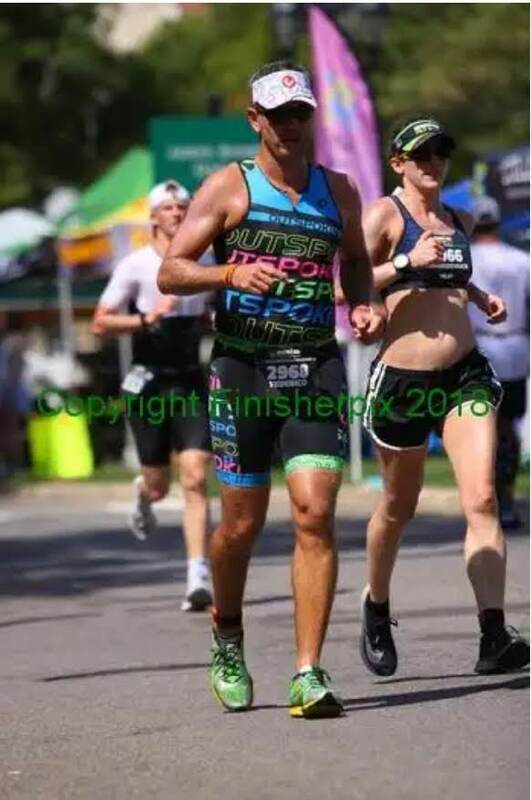 I wove in and out of people as I made my way out of the bike transition area and onto the asphalt of the course. 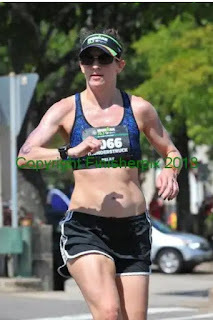 Beth was standing on the corner near the finish chute and we cheered as I pumped my arms down the red carpet. Last 0.1 at 7:17. I am 1/3 of a half Ironman finisher! Volunteers were asking if everyone was okay as they stumble past the finish line. I was tired and hot, but not in need medical care. In fact, as soon as I grabbed the medals and finishers' hats for me and my teammates, I remembered that I still had a cool down run to do! Old Carissa would have just said that 14+ was enough, but I am determined to do this training cycle right! So I found my teammates, gave them their bling, and got a photo before heading out for a 15 minute cool down. After my cool down, I headed back to the finishers' area to grab some food and a celebratory beer. Then, I hung out with the SFTC and cheered the other racers as they wrapped up their days. We ended up coming in 5th out of 74 relay teams and my final run time was 1:40:36! But I'm satisfied with the result. 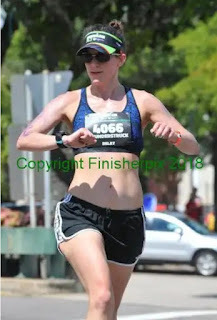 I've run a faster half marathon split in a full marathon so obviously I'm not super excited about my time. But given the conditions and the fact that I was cleared to run 7 weeks ago, I am satisfied. 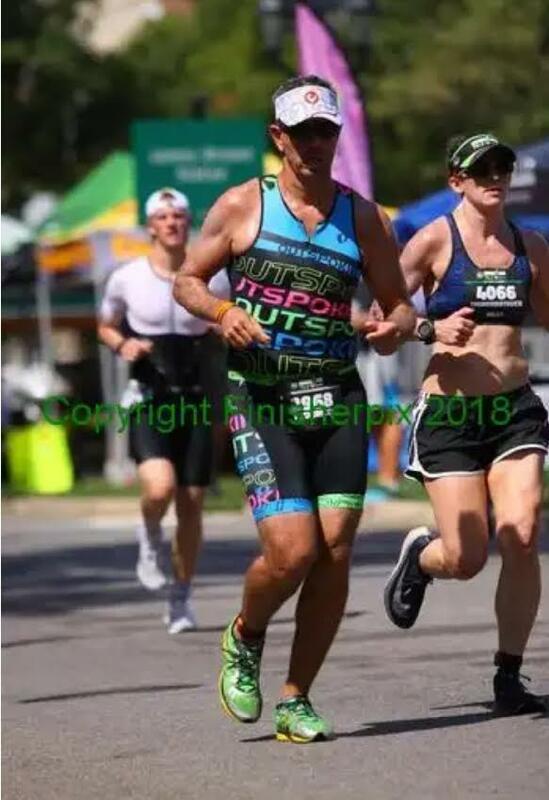 Next up: Hinson Lake 24 Hour on Saturday! Goal is to run 20-31 miles over the course of 24 hours and eat the pizza while it is hot for once. It will strange to not be competitive, but good for me to watch and cheer on other people looking to reach their big goals.